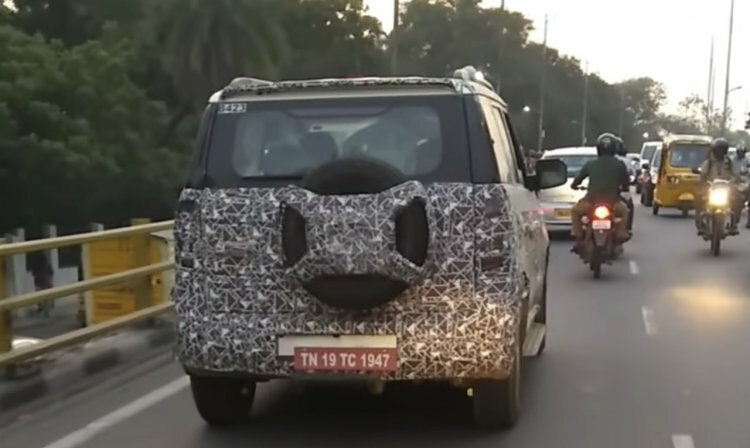 On 25 September, it was reported that the Mahindra TUV300 is about to get its mid-life update in 2019. In sync with this news, the facelifted model has been spotted testing in Chennai by YouTube user 'Purush D man'. As can be observed in the spy video, the 2019 Mahindra TUV300 has received a new spare wheel cover, new design alloy wheels, and touchscreen infotainment. The X-shaped wheel cover is from the Endurance edition that was displayed at Auto Expo 2016. Furthermore, the new model will reportedly receive a revised body structure so that it complies with the new crash test norms that come into effect in October 2019. Moreover, it will feature a BSVI-compliant engine to meet the stricter emission norms that will come into force on 1 April 2020, although it's unknown whether that will happen at launch or at a later date. A similar set of revisions should make it to the TUV300 Plus, but maybe at a later date. Currently, the Mahindra TUV300 is powered by a 1.5-litre mHawk100 four-cylinder turbocharged diesel engine that produces a maximum power of 100 bhp and a peak torque of 240 Nm. This engine comes mated to a standard 5-speed manual transmission or an optional 5-speed AMT. Standard safety net comprises dual front airbags and ABS with EBD. The updated version will be required to additionally offer reverse parking sensors, front seatbelt reminder (SBR), speed alert warning system, speed-sensing auto lock and impact-sensing door unlock to comply with the new safety regulations that come into effect in 2019. With the mid-cycle facelift, the Mahindra TUV300 should comply with the stricter crash safety norms. The Mahindra TUV300's prices currently start at INR 8.31 lakh*. The substantial upgrades arriving with the mid-cycle update will lead to a moderate price hike.